For the impatient lot, here’s a quick summary of the review for your first, before we jump to the full length review right after the image gallery. J shaped wire between the Left and Right bud. Great for portability. Warranty is only 1 year in comparison to all other competitors out there. Quite a lot of fakes rolling around on the internet – Buy it from an Authorised dealer to save yourself the hassle. Once you get a good fit with the Sony’s they turn out to be excellent, better than any other phones I’ve heard for under £50. More so, after 1 year and careful use, the J splitter fell apart, meaning I had to glue and tape it back together to prevent it from getting damaged further. 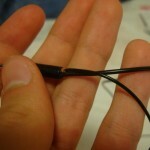 So be warned, the cable isn’t the best aspect of these earphones. 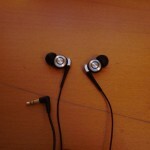 This review will explain what the earphones are about, and what makes them stand out in comparison to their competitors. Alongside this, I will publish some photos, for you, the customer, like myself to see and get a bigger/better picture of what you are in fact buying. First off, I would like to say, that I am quite keen on music. I listen to mainly R’n’B music, with the accompany of Dance and some classic guitar songs, such as some Santana. I will explain the basics of what makes these earphones better than the rest. I have to admit when I bought these I had to ask some good friends and look online to find out what a diaphragm was. (I never took Biology seriously anyway…:P). It basically is the coil inside your speaker that produces the waves which are the sounds that come to your ears. Therefore the Multi Layer Diaphragm means that there are 2 coils operating at the same time. Now you might ask yourself: But how do these help my hearing? Basically, 2 is always better than 1 (*That’s what she said*…had to…:D) and therefore this means your earphones will produce different sounds at different given times. Thus in conclusion they give you different sounds at once. Rather than one jumbled sound wave. A good example of this would be when listening to guitar music, when you hear the guitar, the bass, and the vocals all in one sound wave. Whereas “normal” earphones under £10 would jumble these sounds together, these earphones differentiate the sounds and give you an altogether better experience. This is why people pay more for extra drivers in their earphones. 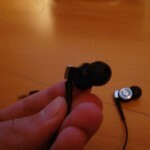 The price of an extra diaphragm or a driver raises the cost of earphones quite significantly. Thus when you see a pair of Westone 3’s know that there are 3 drivers running that baby. The cost? Over £300. Quite expensive for your average user, but when it comes to intricate detail and sound, then those drivers start shinning through. This gives you an idea why a dual core is less expensive than a quad core. That’s an easier example to look at. They are odd, in comparison to normal earphones, like the Sennheisers, but these earphones work in a way that they diagonally go into your ear. 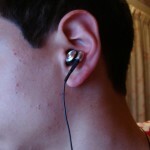 Although it says: “vertically positioned in-the-ear”, vertical gives off the wrong impression. 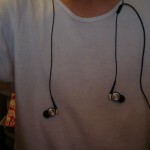 The comfort of these earphones are lovely, you hardly feel them and they aren’t heavy on the ears. 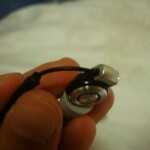 I listen to a lot of music, at any given moment in the day and I will try to put my earphones on whenever I can. Hopefully the pictures should demonstrate what I mean. 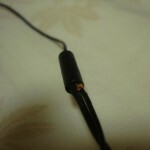 The wire doesn’t cause any microphonics (cable noise) when worn, however does get tangled pretty well. I always have to spend a minute or 2 un-tangling these earphones, before I can use them. In terms of the quality of the wire, it’s reasonably well, but for someone like me who is always tidy and keeps his tech in good working order, these earphones have unfortunately fallen to bits. I have had to super glue the wire and tape it after a solid 2 Years use. So remember, even though you are dishing out more money for good earphones; try to remember that wear and tear will get the better of them. Overall, for the price you are paying, I think these are the best earphones you can get for under £60. I paid £40, and my friend that I recommended it to, paid only £35 (before the slump in the economy) – they currently sit between £40-50 on Amazon. If these were made out of foam, I think they would have been better. 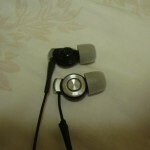 Using Comply’s T-400 or the Tx-400’s increase the sound quality (in my opinion) and the comfort. By comfort I mean that it doesn’t fall off whilst you run, or sweat. Whereas, the silicone ones fall out of your ear all too often. So having some foam tips really improves your listening experience and your sound isolation. There is leakage when you listen to these earphones. 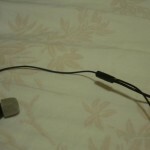 Therefore, when you are listening to something, other people will be able to hear it a little. To be honest, who cares, as long as you are listening to the earphones who cares what others can hear – Regardless it’s not as bad as those stock earphones you get with apple! Bit harsh on the treble at first, but your ears learn to love them. Thus burn-in time I think is almost crucial for the full aluminium goodness of the Ex500’s. In other words, when you get them out of the box, they might sound harsh to you, but after around 50hrs of listening they will start to improve in the quality. 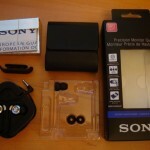 This entry was posted in Audio Reviews and tagged Earphone, MDR-EX500, Review, Sony on September 21, 2011 by TotallydubbedHD.